In the late-18th century, the relationship between political thought and rational inquiry was at high tide. In 1776, Thomas Jefferson built the case for American independence as a matter of the people being impelled by causes that had their roots in “self evident truths”. We have discussed the relationship between Joseph Priestley’s radical politics and his understanding of natural philosophy on this blog. Nowhere, however, was the relationship so clear and so important as in Revolutionary France. In the years after the first stages of the Revolution in 1789, ecclesiastical and hereditary authority was systematically erased from the French state so as to be replaced by a government founded upon reason, acting in the interests of the French people. High on the agenda was the reform of weights and measures. At the time of the Revolution, it was estimated that there were some eight hundred names for measuring units, which with local variants spun out into some 250,000 different standards. Famously, the French invented the metric system to bring some coherence to this system, and, in the words of Condorcet, to provide measures that would be valid “for all people, for all time”. Some of the aspects of the new system, such as the ten-month calendar, the ten-day week, and the ten-hour day did not survive, while the gram and the meter are now widely used throughout the world. These measurements, being universal, were supposed to have some universal basis, rather than derive from arbitrary fiat. With this goal in mind, the Academy of Sciences decided that, among competing proposals for the fundamental unit of length, setting the meter precisely equal to 1/10,000,000 the distance from the North Pole to the Equator would be the best . To find this length, the Academy sponsored an expedition to use triangulation techniques familiar from surveying to find the precise distance from Barcelona to Dunkirk, and to extrapolate the arc from there. To make the measurements, it sent out two prominent astronomers, Jean-Baptiste-Joseph Delambre and Pierre-François-André Méchain (both students of France’s most eminent astronomer, Joseph-Jérôme Lalande, a short, ugly man with a penchant for self-advertising). 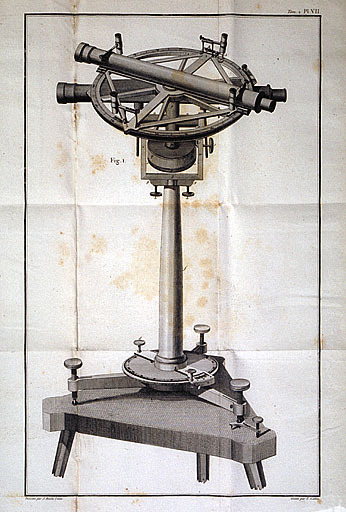 In the late-18th century, astronomy was the only science where extreme precision was expected, and these two were armed with a state-of-the-art instrument called the “repeating circle”, designed by the eminent physical experimenter Jean-Charles de Borda, which could be used to accumulate multiple readings of very precise angles rapidly, so that a very very precise average value could be obtained. With small teams of asssitants, Delambre set out north, Méchain set out south, and, from 1792 to 1799, the two climbed mountains and church steeples, built observing towers, endured cold nights and poor visibility, and made their measurements amid revolutionary tumult. The Revolution’s impacts could produce annoyances, such as destroying the steeple-top markers the two were using to make observations; it could threaten the mission by cutting off funding; and it could be truly dangerous. Delambre was temporarily detained almost immediately, and the Revolution claimed the lives of prominent people like the celebrated chemical experimenter Antoine-Laurent Lavoisier, executed by guillotine, and Condorcet, who committed suicide to avoid arrest. The war the Revolution produced with Spain also trapped Méchain near Barcelona. This misfortune gave the meticulous astronomer the opportunity to take multiple sets of measurements of the latitude of Barcelona, and also to tour a mill, where he was grievously injured by the milling machinery. Méchain ultimately recovered from his injuries and made it back to France, but, as he began to collate his data from Spain, he found that his multiple measurements revealed irreconcilable readings of Barcelona’s latitude. Unable to return to Spain, he was racked with guilt as he made his slow, recalcitrant way back north to Paris. Meanwhile, by 1797, Delambre had worked his way toward completing his measurements, and he and the Academy began demanding Méchain’s data and his return to Paris, even sending his wife to reason with him, to no avail. In November 1798, Delambre finally met up with Méchain himself, and the two returned to a hero’s welcome. The one actual measurement of distance was about 10 kilometers long, taken by Delambre in the town of Melun in the spring of 1798. In 1799, the length of the meter was reified into a platinum bar, and it was slowly deployed as the standard measurement of France, to uneven effect. Delambre and Méchain’s data and calculations were subjected to intense scrutiny, but Méchain’s error was not discovered because he had deployed (illegitimate) corrections to reconcile his data. Named the chief astronomer of France, Méchain’s guilt grew deeper, and he died on a new expedition to Spain in 1804. Taking custody of his records, Delambre discovered Méchain’s aberrant data and subsequent cover-up, and hid it. The first volume of Delambre’s masterwork of data analysis, Base du système métrique, appeared in January 1806. According to satellite measurements, it is 10,002,290 meters from the Equator to the North Pole, meaning the 1799 meter was .2 millimeters too short. Méchain’s incorrect latitude data was a result of a systematic error caused by his repeating circle. In 1829, Jean-Nicolas Nicollet found the latitude data from Spain to be entirely consistent, if error analysis principles correcting for systematic error, not available a quarter century earlier, were applied. In any case, a provisional meter, issued in 1793, turned out to be more “correct” than the 1799 meter, or even a revised estimate offered by Delambre in 1810 (adjusting it about the thickness of a sheet of paper). The basis for this post (including its general tone) is a book called The Measure of All Things (2002), written by Ken Alder, who advised my undergraduate senior thesis at Northwestern. Ken’s first book was a novel, and this book shows his commitment to producing lively narratives. It’s a superb example of rigorous scholarship and argument informing a popular presentation—a nice example of what can be achieved using the “elegant” style. I spent a few summers on a survey crew measure fault zone displacements with heavy, invar leveling rods. The work was grueling and back breaking (especially in Mojave Desert!). But I can’t imagine the herculean effort for the metric meridian survey. And during war time! I’ve read Alder’s book and was enthralled with the story. Thanks for this post. To quibble, wasn’t it Benjamin Franklin’s suggestion to use the phrase “self evident,” replacing Jefferson’s original “We hold these truths to be sacred and undeniable”? I hadn’t heard that (or maybe I did; I remember Franklin pestering Jefferson about wording in the John Adams miniseries!). In any case, I’d buy it. They were both students of Enlightenment political philosophy.